Daxx Group - Cables & Terminals. 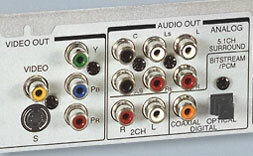 HDMI - Audio - Video - Speaker Cables. 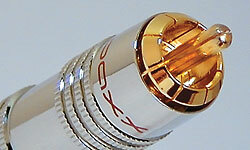 Use our famous DAXX T09 Super Plug with 24 Karat gold-plated center-split tip and eight-cut ground sleeve as the ideal connection for any of your audio or video components. DAXX R88 Interconnect Cable is designed to provide the finest possible interface between the components of your audio system. This cable utilizes a phase-correct construction using two twisted-pair conductors with directional drain wires and Mylar foil shields. To reduce distortion, the conductor's strands are made from a high purity, 100% oxygen-free copper with a unidirectional crystal structure and a mirror smooth finish. Each pair of this cable is individually shielded from one another, and is further twisted around each other in order to enhance the common mode rejection capability of the cable. Such a complex triple shielded design provides maximum protection from alternator noise and magnetic fields. The outer black nylon jacket protects PVC insulation from cuts and abrasions. The R88 interconnect cable is the definitive choice for car audio and home theatre audio cables for the exigent audiophiles. WHY DO WE USE GOLD for our contact surfaces? First, GOLD is an excellent coating choice for connector surfaces that are repeatedly connected and disconnected. And second, GOLD does not oxidize, always stays clean and maintains superior signal transfer and sonic excellence. The R97 High Dedinition Multimedia Interface (ver 1.4) cable is created for application in the sphere of high quality digital picture and sound transmission. This kind of connection delivers crystal clear picture and extraordinary digital multi-channel sound. The R97 uses triple shielded construction (two mylar foil shields and copper braid) with 23 AWG silver-plated oxygen-free copper conductors. The pure silver coating enhances high-frequency response and is very important for correct digital audio/video long run signal transmission. This cable suppots: 1080p, 3-Dimension picture, Deep Color, 2Kx4K and 10.2Gbps/340MHz for lengths less than 7 meters, Ethernet and Audio Return Channel (HEAC). 24K gold-plated contacts resist corrosion and provide stable and reliable connection. DAXX offers you a myriad of audio and video interconects such as digital coaxials, fiber optic cables, Super VHS cables and SCARTs. Daxx also offers a wide variety of tools, gears, grilles, adhesives and more in order to ensure that our customers are equipped with the ultimate car audio and home theatre system installation tools. DAXX is a registered trade mark of Daxx Group Inc.